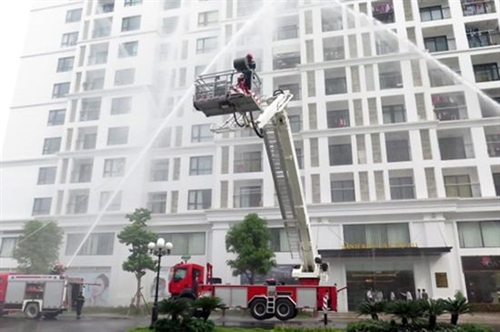 HÀ NỘI – The Hà Nội Department of Fire Prevention and Control has released a list of 38 apartment buildings that are in use but do not meet fire safety regulations. A majority of these buildings are located in Hoàng Mai and Hà Đông districts, which have nine and 14 buildings, respectively, lacking fire safety measures. Many investors and management units were found not following government regulations on fire prevention and control, the department said. As of the end of July, Hà Nội has 1,075 high-rise buildings, of which 916 are operational. The rest are either under construction or have temporarily been shut down. In a related development, the number of fires nationwide this year has fallen slightly (0.3 per cent), when compared with last year, according to statistics from the General Department of Fire Prevention and Control, Rescue and Salvage. About 1,506 cases of fire occurred in the first six months of this year, leaving 31 people dead and injuring 181, besides causing damage to property worth more than VNĐ830 billion (US$37.2 million) and destroying more than 720ha of forests. The reasons for the fires in residential areas and households as well as at businesses were faults of electrical systems and equipment, accounting for almost 600 cases.